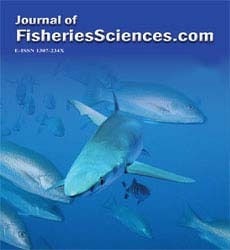 This study was carried out to determine the reason of mortalities in angel fishes (Pterophyllum scalare) kept in an aquarium fish rearing farm in Istanbul pro-vince. In diseased angel fish, which are suffering from loss of appetite followed by mortalities, no external symptoms were observed while clinical signs such as pale liver and kidney, darkened spleen were determined internally. Bacteri-ological inoculation from internal organs such as liver, spleen and kidney of five angel fish obtained from aquarium fish rearing farms were made onto Tryptic Soy Agar (TSA) and after incubation, two isolated bacteria were identi-fied as Aeromonas hydrophila and Citrobacter freundii according to their pshological, morphological and biochemical features. Also these two opportu-nistic pathogenic bacteria were determined to be sensitive to sulphamet-hoxazole and kanamycine according to NCCLS criteria by using disc diffusion method and in the parasitic examination, eggs and adult forms (male and fe-male) of Capillaria sp. were found in the intestinal canal of diseased angel fish.